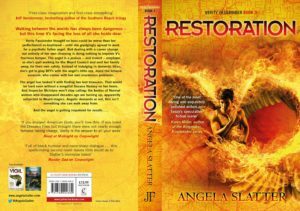 Book for the Restoration launch! Okay, we’ll be launching Restoration, the last book in the Verity Fassbinder trilogy! Kim Wilkins and I will talk, my parents will object to how much we swear, and then everyone will have cupcakes! We’ll be at the Brisbane Square Library on Friday 17 August for a 6.30 start (so PLEASE arrive at 6.00pm). It’s free but you need to book your ticket! Walking between the worlds has always been dangerous – but this time V’s facing the loss of all she holds dear. Verity Fassbinder thought no boss could be worse than her perfectionist ex-boyfriend – until she grudgingly agreed to work for a psychotic fallen angel. Dealing with a career change not entirely of her own choosing is doing nothing to improve V’s already fractious temper. The angel is a jealous – and violent – employer, so she’s quit working for the Weyrd Council and sent her family away, for their own safety. Instead of indulging in domestic bliss, she’s got to play BFFs with the angel’s little spy, Joyce the kitsune assassin… and Joyce comes with her own murderous problems. This entry was posted in News and tagged angela slatter, Brisbane Square Library, hachette australia, jo fletcher books, kim wilkins, Restoration book launch. Bookmark the permalink.